Today, Sunday 27th July was the VK1 SOTA mass activation day. I indicated I would activate Mount Lofty, VK5/SE-005, in the Cleland Conservation Park, and for a short time attempt to become an honorary VK1! I can look out our family room window and see Mount Lofty. Most days Mount Lofty is visible, but over the last few weeks there have been many days when it has been shrouded in cloud. Even though, as the RF travels, at least by ground-wave, we are only about eight kilometres away, the weather is different at Mount Lofty compared with Scott Creek. The Bureau of Meteorology (BOM) even provides a district forecast for Mount Lofty. The Bureau predicted winds from the North West of about 45 kilometres per hour: and they were! Nevertheless, tucked away in our favourite activation spot on the north-eastern side of the summit, it wasn’t too uncomfortable. This was my third activation of Mount Lofty summit and the activation spot in on the Heysen Trail. This is the famous walking trail which traverses the State from Cape Jervis (the departure point for the Kangaroo Island ferry) to Parachilna Gorge in the Flinders Ranges, a total of 1200 kilometres. It was VK5PAS, Paul, who showed me this spot and there were many walkers who gave me a wave and lots of trail bike riders were struggling up the hill or going fast in the opposite direction. Mountain bikes are permitted in the Cleland Conservation Park on this section of the trail, but it is a trial and it is subject to review. I suspect that the Park authorities will be concerned about erosion. I was able to set up and get on the air at about 23:19 UTC and the 40 metre band was really busy with SOTA stations. Here is my log for the 40 minutes before UTC roll-over. It was great and thanks to all of the operators who gave me a call. I managed 31 contacts, including 15 summit to summit contacts. After 00:00 had gone by I enjoyed another burst of activity, totalling 34 contacts, including 14 summit to summit contacts. I said on air to at least one VK1 station, VK1NAM/P1, Andrew, that the mass activation day was a great idea and thanked him for his part in getting it organised. I have not checked the VK1 blogs, but I suspect that many of the amateurs would be activating summits already activated this year and thus would not accrue additional activator points. Sadly the same is true in my case. Today on the first day on Winter, when the heavens threatened rain and it was cold, VK5PAS Paul and I, with twelve budding SOTA and Parks activators, travelled to Mount Lofty and then, later in the morning to Belair National Park, to encourage these new comers to pick up the microphone and call CQ SOTA or CQ Parks. It wasn’t the day for Paul and I to activate the Parks, but, when I was invited to operate I did and was delighted to work four stations on Paul’s FT817 on 20 metres: VK5ZAR, Arno; VK2IO, Gerard; VK2KTT, Paul and VK5YX, Hans. This was my second activation of Mount Lofty and it was an enjoyable day. Paul and I previously activated this summit from the same spot on 6th November 2013. Both Paul and I hope that some of the newcomers, including two brand new amateurs with Foundation Calls, will continue with their endeavours and become regular chasers and perhaps even activators. Spring arrived today magnificently! Twenty seven degrees C was predicted and the Bureau got it right! I decided I would activate a couple of parks in the Adelaide Hills. 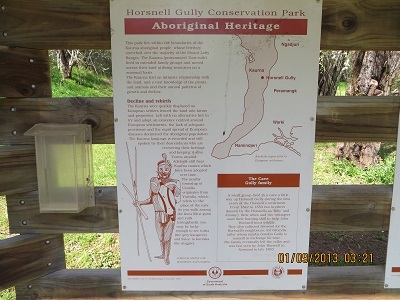 My choices were Horsnell Gully CP and Giles CP, adjoining parks and situated in the foothills near Adelaide, so near to Adelaide in fact, that fingers of suburban development knock at the front door. I arrived and set up at Horsnell Gully a little before my projected time and enjoyed contacts with VK3MRG/p, Marshall at 03:49, 5 and 1 both ways and VK3UBY, Colin at Mildura at 03:53, 5 and 9 both ways. Then there was a break despite me calling CQ. I suspect too many of the regular chasers were involving themselves with their families: perhaps a more appropriate thing to do, especially for those with families nearby. At 04:22 I had a contact with VK5KC, David; VK3FLAG/p at Altona Park, barely satisfactory as Richard’s antenna was too low. Then followed, VK3YY/QRP, Glen; VK5PAS, QRP, Paul at home; VK3FLAG/p, Richard, better this time; VK3EJ, Gordon at Cobram and finally, one of the regular chasers, VK5FMID, Brian from Mt Gambier. Thanks to all who helped me lock this park away for 2013. It is greatly appreciated. It was time to move and I decided that more of the same, sitting in the sun and getting burnt was not good: I gave Giles a miss and decided to move to a higher place: Cleland CP and under the tall gums and not far from Mt Lofty. 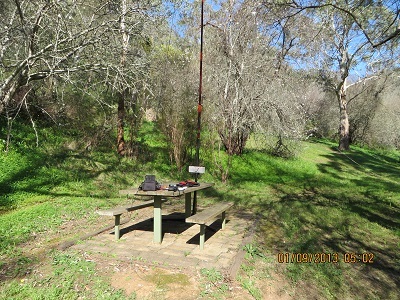 I was at Cleland for an hour and at 05:56 had a contact with VK5LY, Larry; VK5PAS, QRP, Paul at home; VK5ZLT, Alan at Keith; VK3NML, Ray at Melton, VK2NMO, Chris at Gunnedah; VK2FKYM, Jeff and VK3AFW/m, Ron at 06:56. Thanks to all for the contacts and Ron, VK3AFW/m, was very happy to get another park.